Let’s figure out if a triangle is a right triangle. 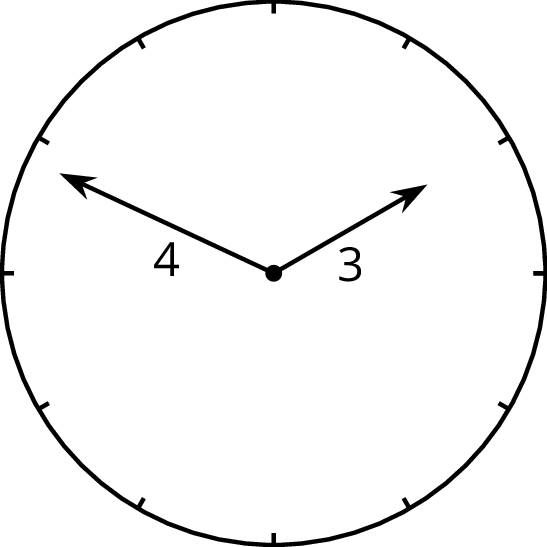 Consider the tips of the hands of an analog clock that has an hour hand that is 3 centimeters long and a minute hand that is 4 centimeters long. What is the farthest apart the two tips get? What is the closest the two tips get? Are the two tips ever exactly five centimeters apart? Here are three triangles with two side lengths measuring 3 and 4 units, and the third side of unknown length. Sort the following six numbers from smallest to largest. Put an equal sign between any you know to be equal. Be ready to explain your reasoning. A similar argument also lets us distinguish acute from obtuse triangles using only their side lengths. Decide if triangles with the following side lengths are acute, right, or obtuse. In right or obtuse triangles, identify which side length is opposite the right or obtuse angle. Given the information provided for the right triangles shown here, find the unknown leg lengths to the nearest tenth. The triangle shown here is not a right triangle. What are two different ways you change one of the values so it would be a right triangle? Sketch these new right triangles, and clearly label the right angle. Is it a right triangle? It’s hard to tell just by looking, and it may be that the sides aren’t drawn to scale. If we have a triangle with side lengths $a$, $b$, and $c$, with $c$ being the longest of the three, then the converse of the Pythagorean Theorem tells us that any time we have $a^2+b^2=c^2$, we must have a right triangle. 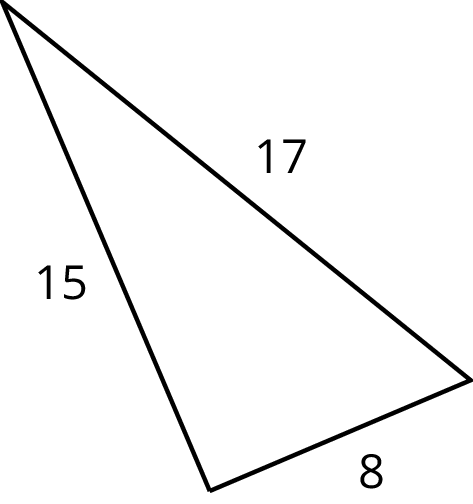 Since $8^2+15^2=64+225=289=17^2$, any triangle with side lengths 8, 15, and 17 must be a right triangle. Together, the Pythagorean Theorem and its converse provide a one-step test for checking to see if a triangle is a right triangle just using its side lengths. If $a^2+b^2=c^2$, it is a right triangle. If $a^2+b^2\neq c^2$, it is not a right triangle.